No doubt about it, your uncle has style. From the boots on his feet to the way he twirls his car keys, he's a man in a class of his own. Which is of course why he's your favorite uncle. 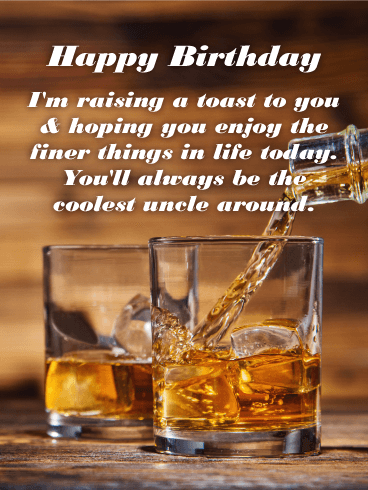 Wish your uncle a birthday just as classy as he is this year and let him know just how much you care for him. He's a man you know you'll treasure for forever. Make sure he feels your love on his birthday. 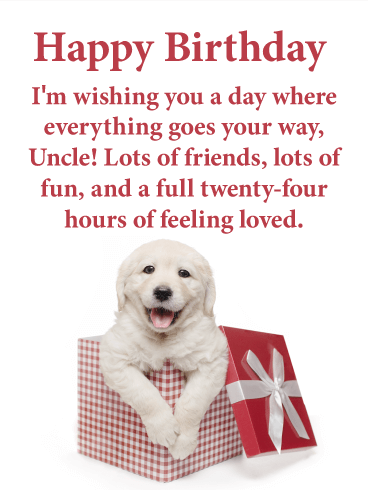 Fill your uncle's birthday with love this year. Let him know exactly how you feel about him: how much you admire him, how much you appreciate his lessons, and how he is everything you hope to be one day. 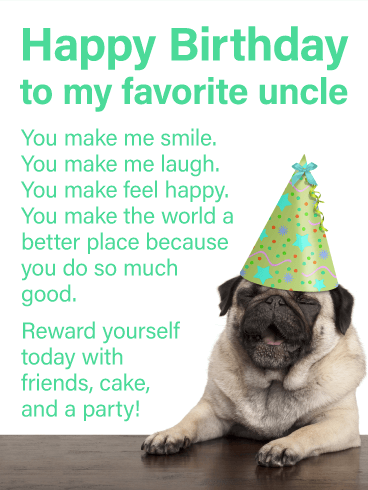 Your uncle has been your second father; let him feel the weight of your feelings on his birthday. Wish him a day as amazing as he is. Your uncle has granted many of your birthday wishes. 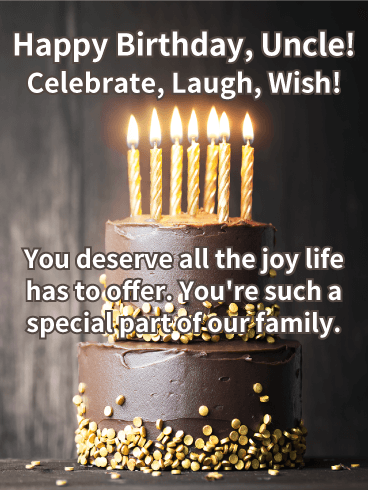 Now it's your turn to fulfill his with this wish-filled card! He's done so much for you over the years and now is the perfect time to start paying him back. He's helped you and now it’s time to lend him support when he needs it. 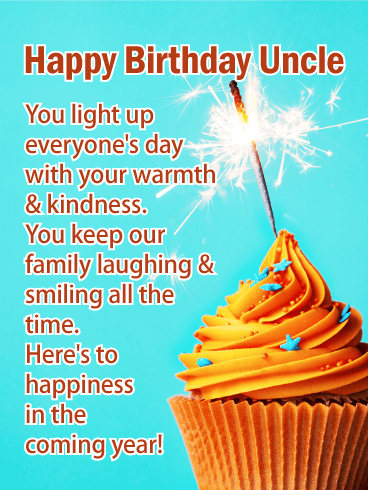 Send your uncle handfuls of wishes for his birthday and let he him know you intended to grant every one. Get his blood pumping this year! Birthdays are full of excitement, from new adventures to the mystery of wrapped gift to memorable shenanigans. 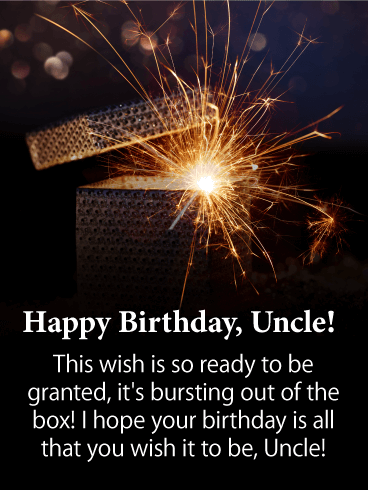 But nothing makes an uncle happier than a sparkling card from his niece or nephew! 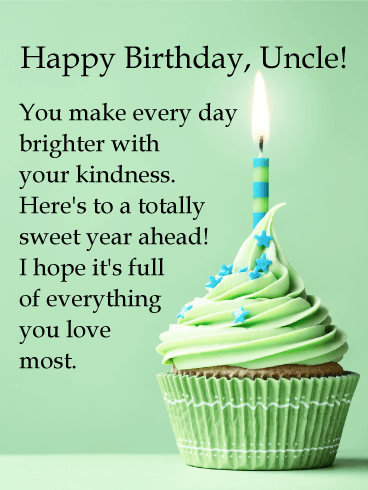 Wish your uncle his heart's desire for his birthday - the wish of all wishes. He's a man who should get nothing less. Make his birthday magical with this mystical card! Every birthday deserves to be celebrated properly, and the day would be remiss if your uncle missed out on a firework show. So send him a private display with this birthday card! He's just a brilliant, just as incredible, as a 4th of July show. 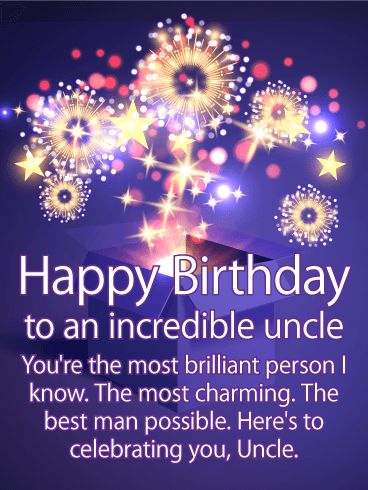 Your uncle's birthday is the day to highlight how amazing he is. 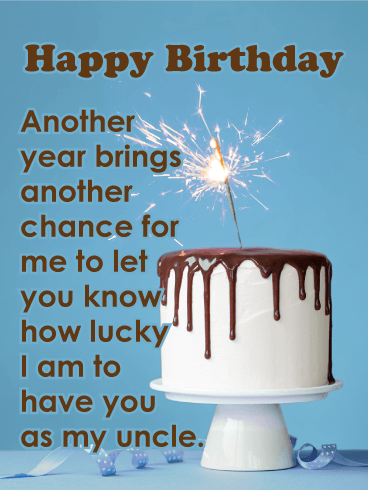 Don't let him forgot that and send this birthday card! 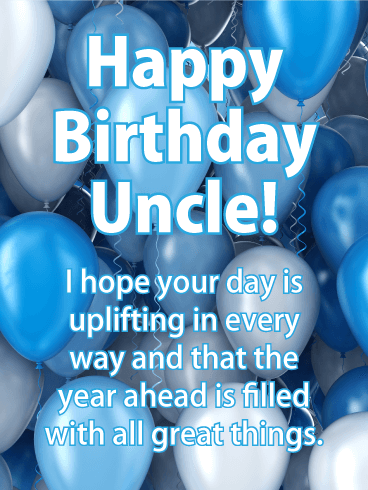 You'll have a special uncle in your life floating on air with this festive birthday card! A sea of blue balloons in the background adds a festive touch, while your best wishes are big & bold right in front. It's a wonderful way to let him know you're thinking of him and hoping his year ahead is filled with all great things. 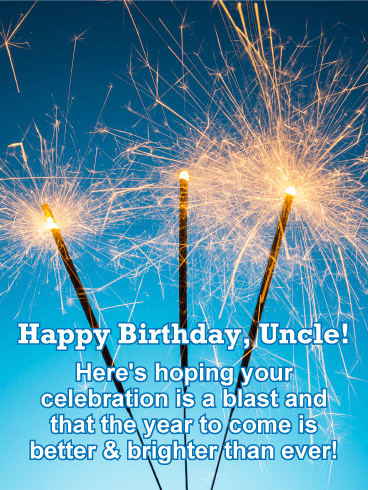 Bright, colorful streamers and confetti add a festive party touch to this birthday card for a special uncle. Adding to the sentiment are your kind and thoughtful words, speaking to the amazing person he is and wishing him a wonderful year ahead. Whether you're near of far this year, he's sure to be touched by this heartfelt greeting. What's better on somebody's birthday than getting to blow out the candles and make a wish before enjoying a delicious, frosted treat? There's an anticipation and excitement that comes with knowing you have a fresh start for the year ahead, filled with possibility. 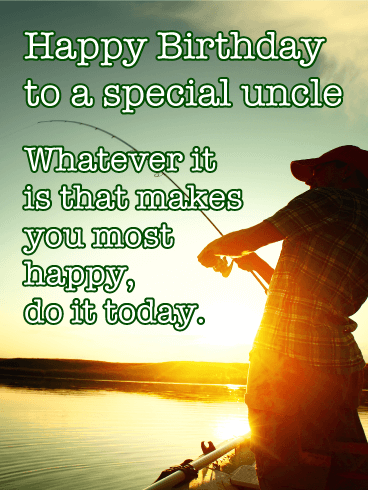 Share that same feeling with a special uncle by sending this uplifting card to remind him that you're wishing him lots of happiness today and always. 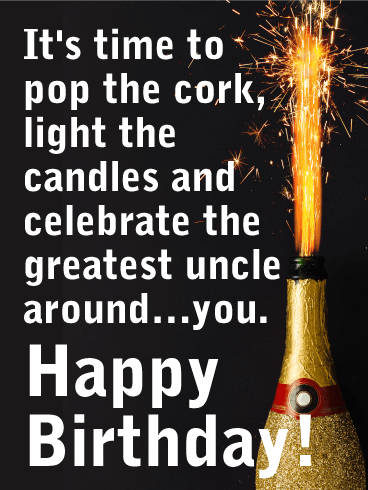 If you have an awesome uncle in your life, let him know it with this festive birthday card. A sprinkle-topped cupcake is topped off by a brilliant sparkler, with lights in the background adding to the celebratory feeling. And above are your wishes for him to be surrounded with warmth and love as he turns another year older. Even if you can't be there with him this year, sharing this thoughtful greeting will make him feel like you are while letting him know how much you care. 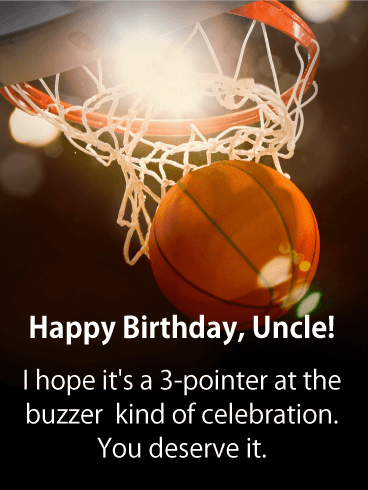 Want to make sure your uncle's birthday is a slam dunk? Send this fun, basketball-themed birthday card! Whether he likes to get out on the court or is more of a spectator these days, he'll appreciate your wishes for a winning celebration and know that you're his #1 fan always! 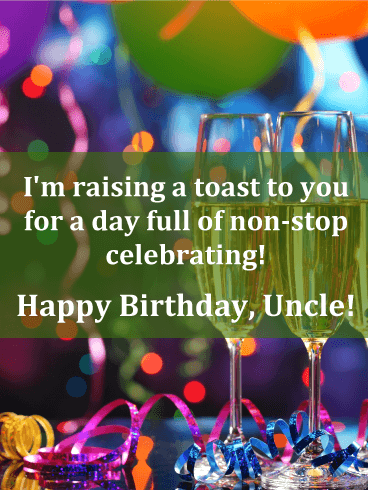 Here's the ultimate card for celebrating your #1 uncle's birthday! A stadium packed with a huge crowd, all on their feet, will make him feel like a winner as your words above wish him an unforgettable day and year ahead. 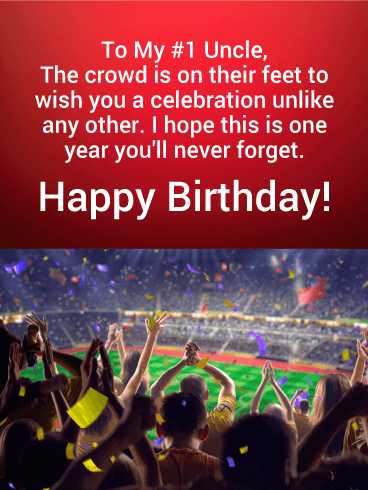 Whether he's the ultimate sports fan or simply enjoys the excitement a birthday celebration brings, this thoughtful greeting card will make him feel appreciated and remembered on his big day. 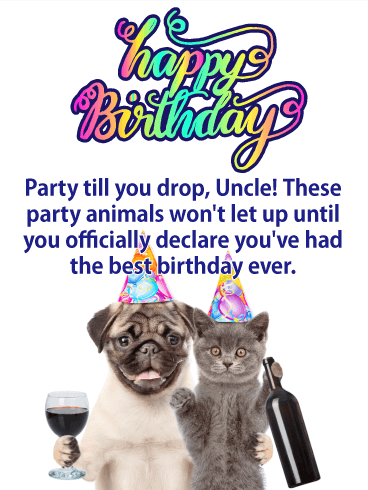 This festive birthday card will have your uncle ready for a party! A brilliant sparkler bursts from a glittery gold Champagne bottle against a black background, bringing your brightest wishes to him as he celebrates. The message may be simple, but this bold greeting gets your sentiments across perfectly, whether you're by his side this year or thinking of him from miles away. 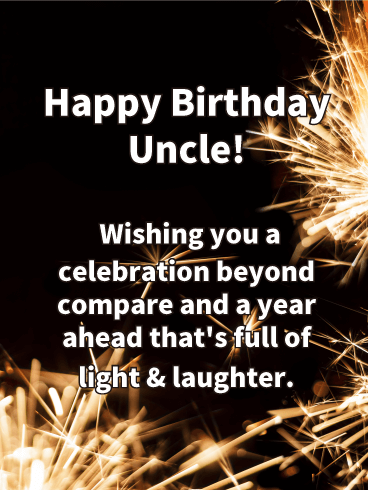 This bright card will guarantee your uncle's birthday is a blast! Blazing sparklers shine against a blue background. And right in front are your inspiring words to him, a wish for a memorable celebration and the very best year ahead. He's sure to smile knowing you remembered him on his big day. Each year brings many new adventures, and there's no better time to remind someone of that than on their birthday. 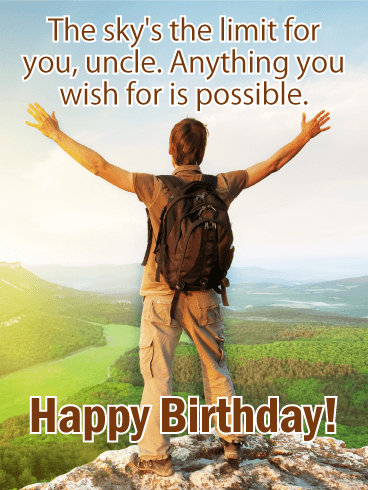 This inspiring birthday card for your incredible uncle features a mountain climber who has made his way to the top, raising his arms in celebration. It's a wonderful way to let him know that the sky's the limit, and anything he wishes for on this special day is possible. 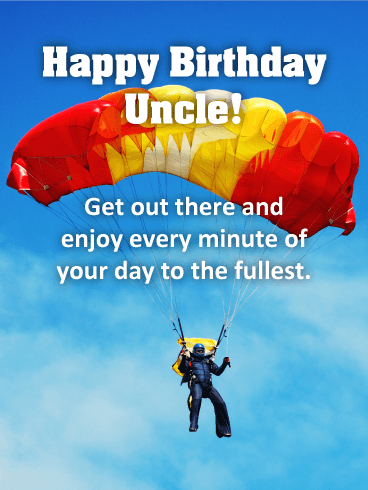 If your uncle has a sense of adventure, or even if he only dreams of soaring to new heights, this exciting birthday card is a great way to wish him a happy birthday. A thrill-seeking skydiver floats down from above, his colorful parachute helping him drift down to the earth, as he waits to touch the ground. 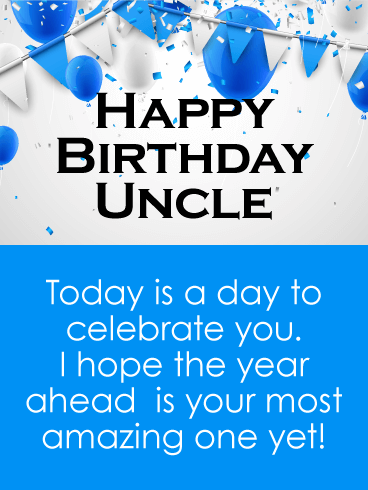 It's a reminder to your uncle to make the most of his celebration any way he wants, while always reaching for the top. He's always encouraged you and told you to follow you dreams. He's not just a part of the family, but a friend as well. 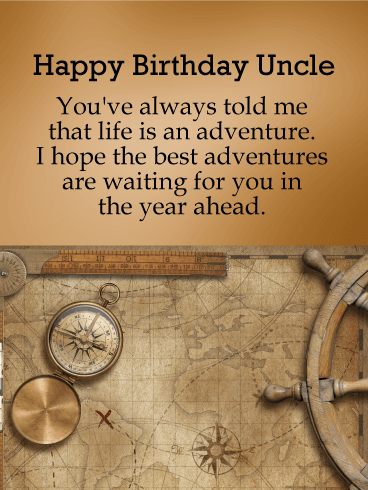 So for a special uncle's birthday, send him this thoughtful card to remind him that the best adventures are waiting to come in the year ahead. With a compass and map to set the course, the only question is where his first journey will be! He's a great uncle in every way, and you're so fortunate to have him in your life. This year, let him know with a special card that will put him in the mood for a celebration. Featuring a chocolate-drizzled cake, complete with a sparkler on top for an extra festive touch, this is one birthday wish he'll remember until next year. 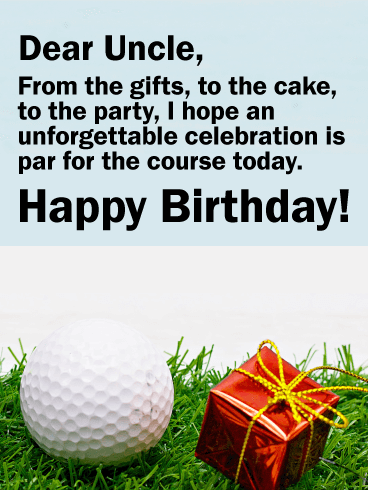 Make sure your uncle's birthday is a hole in one this year by sending a fun, golf-themed card! A golf ball and gift box are sitting on the green, waiting to help him celebrate turning another year older in sporty style. It's all par for the course for someone as awesome as he is. 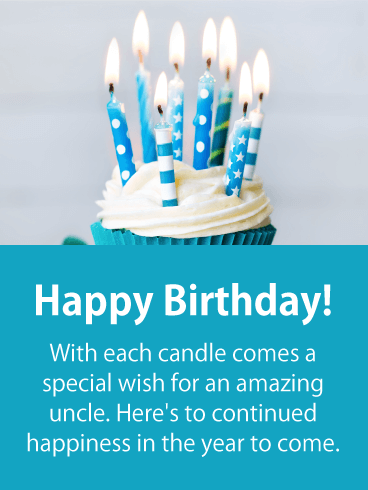 Bright balloons, party hats, presents, confetti and candles: all the ingredients for making your uncle's birthday the best one yet! This festive card on a blue background is a fun way to wish him a great year ahead, whether you’re celebrating together or sending your warm thoughts from miles away. 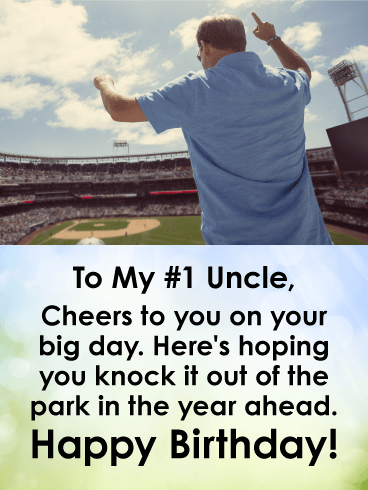 Wish your #1 uncle an all-star birthday with this baseball themed birthday card. A fan is enjoying a sunny day at the ballpark, rooting on his favorite team under a blue sky. If that's how your uncle loves to spend his days, he'll enjoy everything about this special greeting, and look forward to knocking it out of the park in the year ahead! He lights up everyone's day with his kindness and caring. He's a mentor and friend in every way. 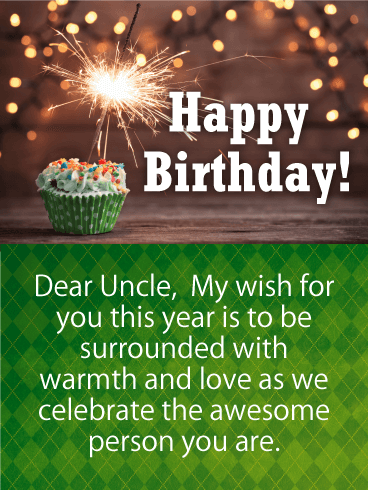 This year, let your uncle know how much he means to you with this festive birthday card, the perfect greeting for any celebration! A cupcake with a bright sparkler on top is the sweetest way to wish him happiness in the year ahead. Two cocktails are being poured for a toast, while a cigar rests next to them, lit and ready to be enjoyed. If this is your uncle's idea of the perfect birthday, then this is the card for him. It's a way to send your best wishes for a day full of relaxation, treating him to all the finer things in life as he celebrates another year. A boat setting sail at sunset paints the perfect scene for a great birthday. 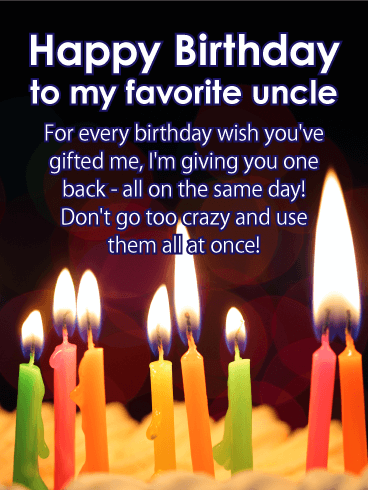 It's also a wonderful way to wish your uncle a day he'll never forget, and a year ahead that's just as memorable. He's someone you've always looked up to, and who you look at as not only part of your family, but as your friend. be remembered on his birthday...and this card is a great way to make it unforgettable. A black background comes alive with golden fireworks, helping to convey your best wishes in the biggest and boldest way possible to someone who means a lot to you. 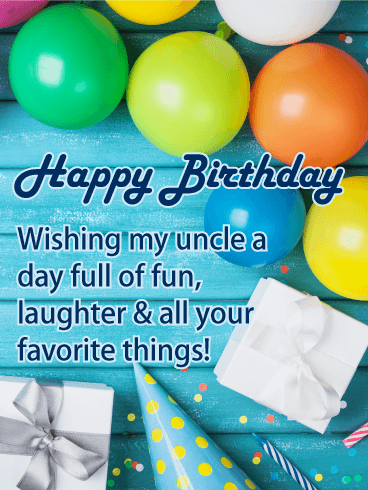 Here's a fun birthday wish for a totally cool uncle! A delicious-looking cupcake topped with a single candle is a wonderful way to wish him a totally sweet year ahead filled with all good things. 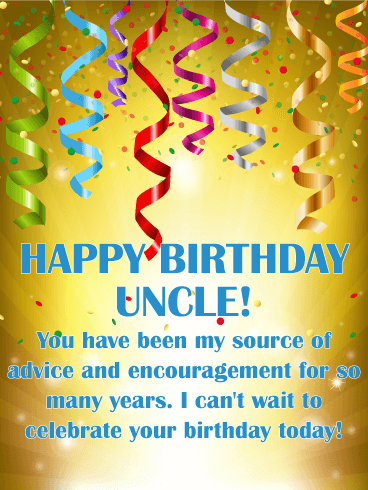 Your uncle is simply the best around, and this card is one sure to make him feel very happy on his birthday! Blue fireworks burst in the background behind a bold greeting, letting him know there's lots of celebrating to be done and hoping he has lots of fun doing it! 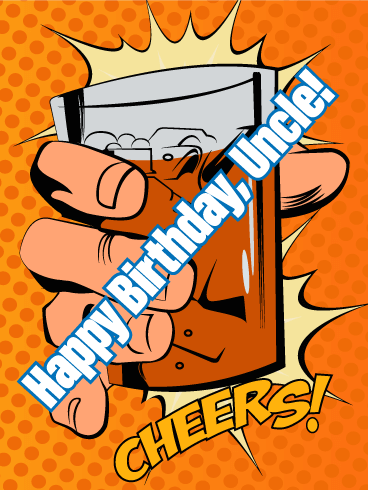 Whether you're there with him celebrating, or you're lifting up your glass from miles away, raise a toast to your #1 uncle with this cool birthday card. Two shots are waiting to be enjoyed, and a banner and brightly lit candle both add a festive touch, helping to make his day even more memorable. 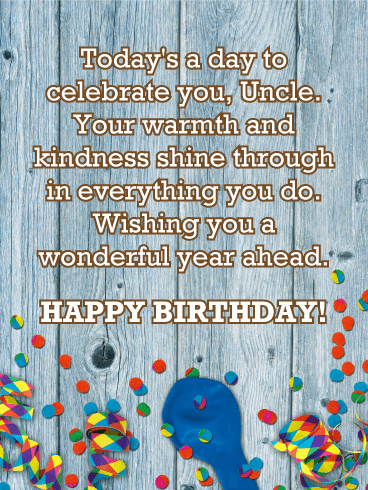 Life is an amazing journey, and a birthday is the perfect time to let a special uncle in your family know. 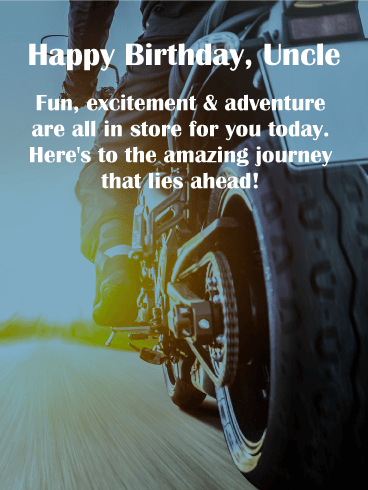 The rear view shot of a motorcycle is a wonderful reminder that the best adventure is ahead, as he celebrates another year of being the awesome person he is! 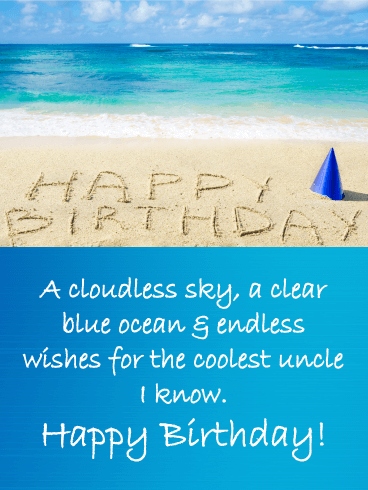 A stretch of white sand, complete with a blue party hat and "Happy Birthday" message, will bring your best wishes to an uncle who means so much to you and deserves a relaxing day doing whatever it is he loves most. 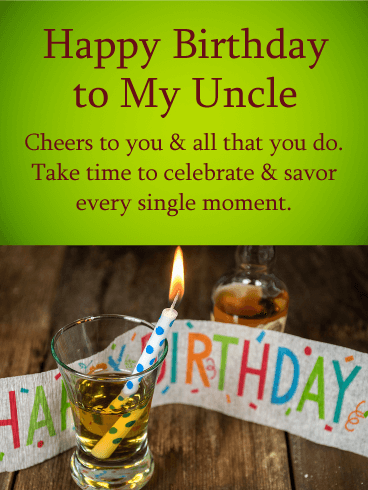 We should always do what makes us happy on our birthday...and your uncle is not exception! 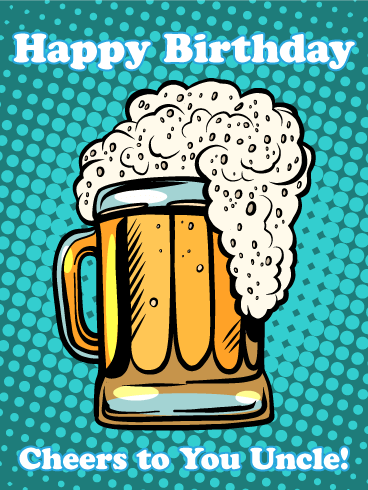 So when his special celebration rolls around, remind him to take the time to do exactly what he wants, whether it's spending the day solo...or surrounded by family & friends. 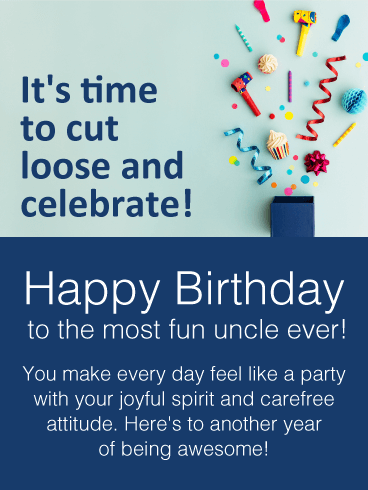 It's your uncle's birthday! Make it his very best one yet by sending this totally fun and festive card. A gift box is bursting with everything a good party needs: streamers, blowers, confetti and cupcakes, of course. 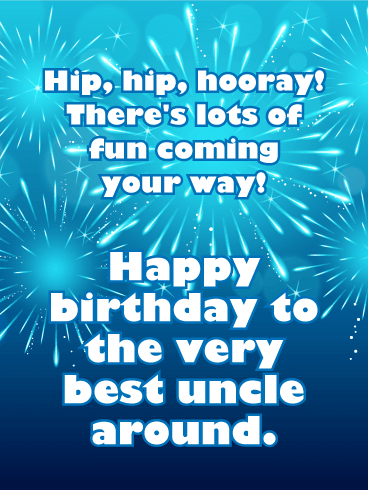 And the most important element is your wish for a celebration unlike any other for the "most fun uncle ever!" 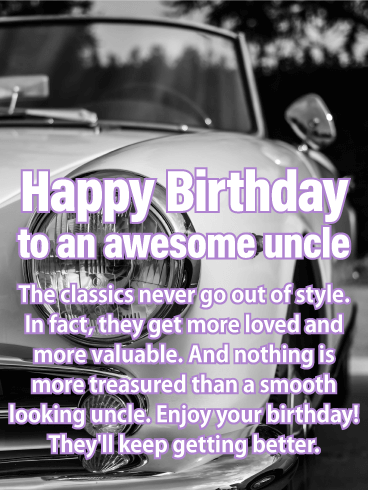 Your uncle is such a special part of the family, and this birthday card will let him know. A chocolate cake topped with brightly lit candles sits waiting to be enjoyed. Of course, the wish is always the most important part, and this greeting brings your wishes for a fun-filled celebration he'll always remember. 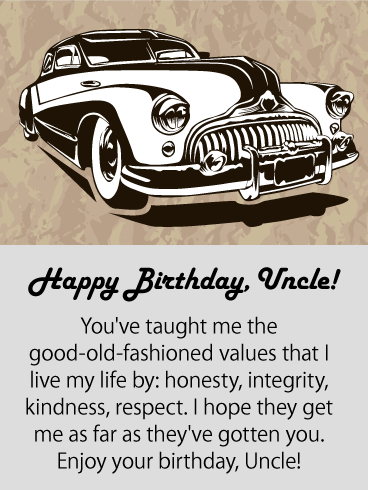 Celebrate your uncle's birthday and let him know how encouraging he's been to you all these years. You're excited to celebrate him and his birthday, and this birthday card will let him know. This birthday card looks like the party is about to start. The streamers are hung and glitter is raining down. 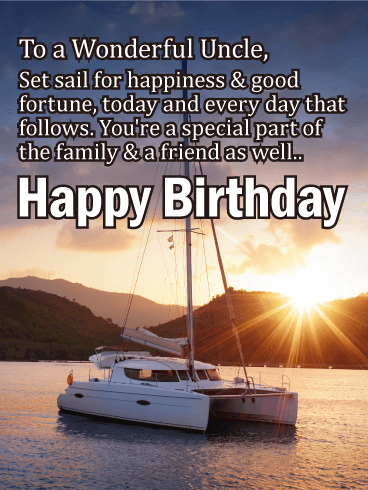 Your birthday message is highlighted on a golden background.